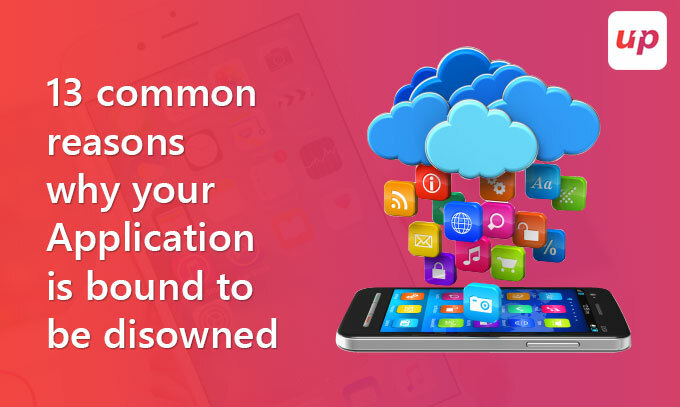 Home Mobile Apps Android 13 Common reasons why your Application is bound to be disowned?? Being a mobile app developer, this is a major area of concern if their designed product fails miserably to draw satisfying downloads. If we refer to the report made by Statista, we will be surprised to see there are 2.2 million apps lying in Apple’s App Store and Google Play store contains near about 2.8 million apps as of March 2017. To get your application visible in the app store search queries is quite a brainstorming job. Hiring the service of a dedicated mobile application developer, however, takes care of all these factors that necessitate success of the mobile applications. Despite continuous efforts, if your application continues to show unsatisfying results then you are definitely committing some error somewhere. It is time to make an investigation of such factors to clear your confusion. Before we begin with the discussion, as a mobile developer, it is imperative for you to remember that your application stands less than a minute chance before which the decision is made by the smartphone user to either retain or discard the application. So, let’s see which are the common reasons working behind the rejection of your application?? Inadequate market research- The highly competitive nature of mobile technology exerts tremendous pressure on application developers to not only design an innovative, bug-free and flawless application but conduct an extensive research even before employing the resources in app development process. Research on the concept’s market potentiality, possible competitors, target customers, market segment and such other factors form a part of the big picture. Do not ignore this point at all. Unsure of Application OS- Market research made on your target customers and niche segment will clarify which platform i.e either Android or iOS, you are likely to target. But if you have plans to reach out to a major audience, then developing for multi-platforms is most advisable. Failed to comply with recent technologies- Pokemon Go has successfully utilized the recent technology to create an Augmented Reality based gaming application enticing the smartphone users to an extent of getting them addicted to it. Ignoring the importance of modern technology implementation can be a big mistake for app developers. Poor user onboarding experience- The tutorial or application guide must not be ignored. Onboarding is the perfect time to create a lasting first impression on your users and get them acquainted with the various application intricacies. Security and privacy concerns- Observing strict security measures and privacy policies are dominant factors underlying the large-scale abandonment of mobile applications. Any competent mobile application development company cannot ignore the imperativeness of observing strict security measures and avoiding in-app permissions, selling user data, geolocation tracking and unauthorized posting to social media platforms to retain users’ trust with the app. Irrelevant UI and poor UX- User Interface and User Experience are the two vitals for an app success that renders an incredible user experience which is based on target customers’ perspective. Imperfect app testing- Do not ignore the importance of App testing since a single error can cause huge irritation among application users. Testing phase familiarizes you with bugs and security issues. Any feedback on app usage errors need to be rectified and updated, also featuring new attributes result in drawing satisfying user reviews and ratings. Lack of marketing strategies- The application will only gain handsome downloads if it has successfully created quite a buzz through proper marketing strategy. App marketing and app store optimization require proper planning and experience to create awareness and increase visibility in the search queries. The app is easily replaceable- This is quite a harsh fact to digest for either iOS or Android app developers hired and i.e their developed application has easy replaceable across the Google and Apple app store. Instead of getting demotivated, it is rather advisable to consider this fact as a source of inspiration to push the developers to come up with some uniqueness in the application to make it stand out in the crowd. Building an irreplaceable, abandonment-fighting mobile app is a nerve wrecking process but if you can touch the realm of few popular high-quality mobile apps such as iScanner, Facetune etc. then you have accomplished a lot. Ad clutter- In-app advertisements may be the lucrative option for any budding app developer to monetize from the otherwise free application yet this very factor has contributed to discarding the app altogether. Many users opt for as blockers in their devices. Still, there are many others who, if not install ad blockers, will straightaway uninstall the application if too many ads bother them. So before launching the application try to experience the app navigation to understand how the users are going to react and then make ad placements accordingly. Strict entry barriers- the Simple sign-up process using minimal sign-up fields, smart captcha alternatives offer seamless registering procedure which is essential towards retaining application users. People are highly lazy and any intricacies faced at the time of application registration will only rob you of your potential users. Other technical flaws- Smartphone users are pretty much familiar with messages such as ‘App is unresponsive’. This is a technical flaw which is pretty common but if ignored can seriously damage your app’s reputation. Crashing or freezing of mobile applications is common technical flaws that inspire extreme outrage among your app installers. They will go to the extreme extent of uninstalling the application and rating poorly in the app store. Overall poor experience- Smartphone users have a different set of expectations when they install your application. So proper market research prior to mobile app development contributes towards great UX app design or else the application will be directed to the trash can. Users are highly impatient and any poor app usage experience can be really damaging to the application.